The central aspect of the ongoing sculpture is a 50 foot-tall hollow tower of bamboo. Photo: Courtesy of Mike + Doug Starn. VENICE.- Mike and Doug Starn's Big Bambú is being presented as an official collateral exhibition of the 54th Venice Biennale, a special project of GLASSTRESS. The first exhibition of the Starns' Big Bambú series was on the roof of the Metropolitan Museum of Art in New York last year and ranked 4th in the world for total attendance of a contemporary art exhibition in 2010 and was the 9th highest attended exhibit in the entire history of the Metropolitan. Big Bambú is being installed in the courtyard of Casa Artom on the Grand Canal next to the Peggy Guggenheim Collection. This is the first time the site has been used as a location for a collateral exhibition since the famous triumph of American art in 1964 as the annex to the American Pavilion when Robert Rauschenberg won the Grand Prize. The central aspect of the ongoing sculpture is a 50 foot-tall hollow tower of bamboo, with a trail spiraling up and reaching to a 20 foot-wide roof top lounge more than 50 feet above the Grand Canal. The work embodies a contradictory nature: it is always complete, yet remains unfinished, the sculpture is never at rest. 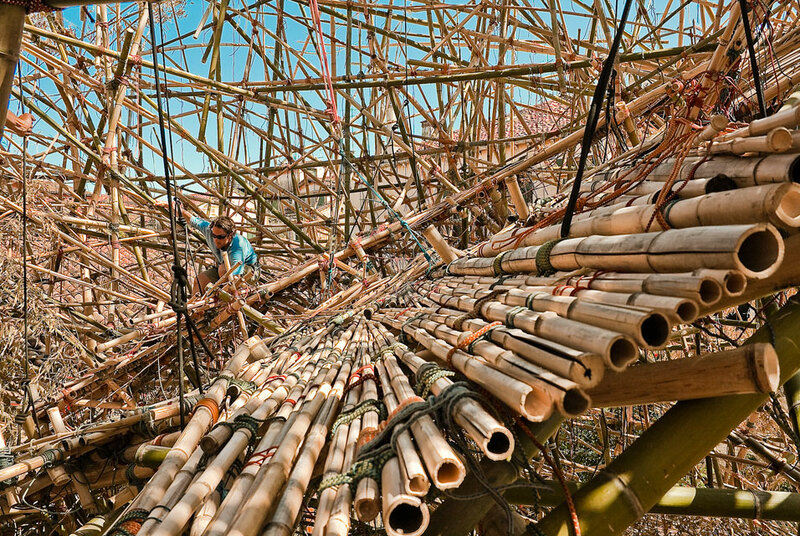 The Starns and a crew of 11 rock climbers from the Metropolitan Museum of Art installation will continue to lash together more than 3,000 bamboo poles, sustaining the spiral upwards and adding an additional 15 to 20 feet of height until closing day on June 18th. The Peggy Guggenheim Collection has invited the Starns to build a bridge from inside Big Bambú to their roof terrace. ), and Big Bambú actually physically presents it, it is philosophical engineering. Everything depends upon one another and the loads are distributed throughout, the interdependence is natural and fluid. There is not too much weight applied to any one thing." As Big Bambú is about the continual evolution of living things, in addition to 2,000 fresh poles harvested from a farm in France, Doug and Mike have cut several of the fragments out of the Metropolitan Museum installation in New York. The Starns explain: "We are grafting a new Big Bambú and using 1,000 poles from the Met as stem cells, the Venice piece will still be the Metropolitan piece but also a new one, Big Bambú is always growing and changing and becoming something new  as we all are." Beginning on June 18th, the team of rock climbers will spend roughly two weeks dismantling Big Bambú. Poles from both the Metropolitan and Venice installations will be used again as stem cells in future installations or as stand alone sculptures, while others will be stored in Europe or shipped back to the United States. Doug and Mike Starn are American artists, identical twins, born 1961. First receiving international attention at the 1987 Whitney Biennial, the Starns are primarily known for working conceptually with photography for the past two and a half decades. Concerned largely with chaos, interconnection and interdependence, time, nature, biology and physics, they continue defying categorization, effectively combining traditionally separate disciplines such as photography, sculpture, architecture and site-specific projects. Their most recent installation was Big Bambú:You Can't, You Don't and You Won't Stop, the 2010 roof garden exhibition of The Metropolitan Museum of Art, New York. Throughout the 6-month exhibit, the Starns and their crew of 10-16 rock climbers continuously lashed and sculpted over 7,000 bamboo poles, a performative architecture of randomly interconnected vectors forming a section of a seascape with a 70' cresting wave above Central Park. Big Bambú suggests the complexity and energy of an ever-growing and changing living organism. The Starns were represented by Leo Castelli from 1989 until his death in 1999. Their work has been the object of numerous museum and gallery exhibitions worldwide. The artists are currently working on a new monograph for the third installment of their exhibition Gravity of Light scheduled in the U.S. in the fall of 2012. Their pieces are represented in important public and private collections internationally. They have received two National Endowment for the Arts Grant; The International Center for Photography's Infinity Award for Fine Art Photography in 1992; and, artists in residency at NASA in the mid-nineties.